Posted on May 15, 2018 at 5:48 am. Ready of not, Williamsburg, but it’s time to take the SOLs! The Virginia Standards of Learning begin TODAY — with all 7th and 8th graders taking the READING exam. Here’s a look at the Testing Schedule for May 15th…. 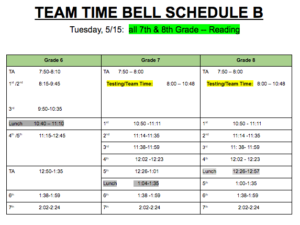 We will be following “Team Time Bell Schedule B” — with 7th and 8th graders testing from 8 a.m. to 10:48, and 6th graders following an adjusted class schedule starting at 8:10. Testing locations are listed on the call-boards by the library, cafeteria, and auditorium, or you can check with your TA teacher. Test-takers are reminded that you may ONLY bring the following items: your fully-charged iPad, a pencil or pen, a book to read, and earbuds ONLY if you have an approved audio accommodation for the test. The WMS Library will be CLOSED today during SOL testing hours. But it WILL be open after school. So be sure to stop by this afternoon and get yourself something good to read — for after your SOLs this month! It’s DAY 2 of Teacher and Staff Appreciation Week — and for today’s special treat, we’ve got FREE FOOD! Teachers are reminded to drop by the Teacher’s Lounge this afternoon for an “almuerzo delicioso” — a delicious lunch courtesy of District Taco. Enjoy the grub, teacher wolves!! This week’s WMS Kindness Club meeting has been RESCHEDULED for THURSDAY during ASP 1 in room 134. Participants will be starting construction on their special school project — and there’s plenty of work to go around. And of course, new members are always welcome to join! See Mr. Johnson, Ms. Schaefer, or Ms. Zeller with any questions. Before we send you off for the first day of SOL testing, we’ve got one last announcement. Ms. Schaefer — from the Student Services Staff — is here at the WOLF-TV studio, bringing us today’s MINDFUL MOMENT. SCHAEFER: Good morning, wolves! I’m Ms. Schaefer, and I’m here to remind you how important it is to “Stress Less, and Laugh More.” Especially now with the looming SOL schedule, it’s so important to get centered and focused to begin your day. Slow purposeful breathing has been shown to boost your immune system, reduce stress, and increase alertness — and what better time to introduce this into your daily routine then right now, before the SOLs begin? So please, let’s just take a moment… and BREATHE. Thanks for joining me with this Mindful Moment. Good luck today, and Go Wolf Pack Pride! !